Property Location In the heart of El Calafate, Xelena Hotel & Suites is close to Laguna Nimez and Gnome Village. 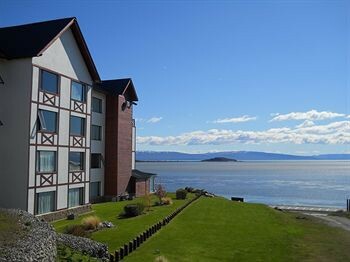 This 4-star hotel is within close proximity of Calafate History Exhibition Hall and El Calafate Regional Museum.Rooms Make yourself at home in one of the 71 air-conditioned rooms featuring minibars and DVD players. Your pillowtop bed comes with Egyptian cotton sheets. Wired and wireless Internet access is complimentary, while 29-inch LCD televisions with cable programming provide entertainment. Private bathrooms with shower/tub combinations feature jetted bathtubs and rainfall showerheads.Rec, Spa, Premium Amenities Be sure to enjoy recreational amenities, including a health club, an indoor pool, and a sauna. Additional amenities include complimentary wireless Internet access, an arcade/game room, and gift shops/newsstands. Guests can get to nearby shops on the complimentary shuttle.Dining Enjoy a meal at a restaurant or in a coffee shop/café. Or stay in and take advantage of the hotel's room service (during limited hours). Mingle with other guests at a complimentary reception, held daily. Quench your thirst with your favorite drink at a bar/lounge.Business, Other Amenities Featured amenities include complimentary high-speed (wired) Internet access, a computer station, and complimentary newspapers in the lobby. This hotel has 2 meeting rooms available for events. Free self parking is available onsite.